Okay, now this I might get. Kudos Elston, this one's kinda cool. 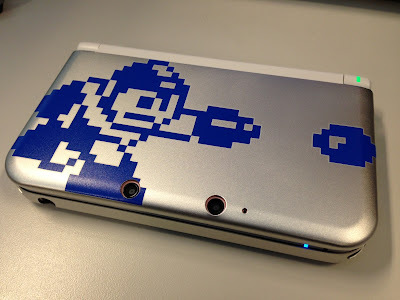 "Hey guys, we put Mega Man on the 3DS, get it?" While I do wish they would use something other than 8-Bit sprites to represent their blue boy, this does look pretty nifty. Depending on price, I may partake. I really like that look! I might have to upgrade pretty soon. Can't Capcom get ANYTHING out the door? Cue the knee-jerk "8-bit sprite is overused" reaction. Despite that, if I did own an XL, I'd probably buy the damn thing anyway because I'm that desperate to convince Capcom that 3DS owners have an interest in Mega Man. Ah well. For those who hold the NES style as paramount, it IS pretty awesome. This looks cool, but it's going to look stupid when open. Mega Man will be upside down! I remember the RnR case they had for the DSi. I really liked that case, it worked quite well. I'll have to look into this for sure. Wish it had multiple incarnations, though. Never was a fan of classic. OK! Now to buy a Mega Man game for 3DS!